Karina Betlem grew up in a family of 5 children, where love and good food was dished out in large portions. Her love of food and cooking is attributed directly to her mom, who, by necessity, invented many new meals for her large family. Cooking and 'experimenting' with recipes finally became a passion for Karina in her mid 20's. This passion grew into a desire to learn as much as she could about food, ingredients and healthy eating. Chocolate she discovered was a major food group, so she also began 'inventing' recipes to make sure she and all her own family got the recommended servings per day. In 1980 she gathered hundreds of recipes from family members and compiled them into a handwritten cookbook as an heirloom to be handed down generation to generation. For many years after that she had the thought of writing a cookbook herself, but life seemed to plod on without this being realized. Several years ago, after seeing the plight of some poor Mexican families, she decided now was the time to do something to help. She had always enjoyed writing, had a good rapport with people and of course, loved to eat! The idea came to her to write an authentic Mexican cookbook using the recipes of several women and men from Colonia Pancho Villa, then giving the proceeds back to the community to assist in their daily lives. Four years later, that dream came true. From the Kitchens of Pancho Villa, written by Karina Ann Betlem, is so much more than a cookbook; it is a collection of recipes, stories, and pictures that share and celebrate a community and authentic Mexican cuisine. From the Kitchens of Pancho Villa begins with an introduction which explains the purpose of this book and how Karina came to creating and publishing it. A general overview of the recipes and layout of the book is shared. Before the actual recipes are shared there is a section devoted to discussing the ingredients as many of these may be different from what one may be used to cooking with. Each chapter is devoted to one of the cooks whom Karina spent time with in order to create this cookbook. There are a few paragraphs shared about each individual and then the recipes that each one prepares in his or her home are shared. 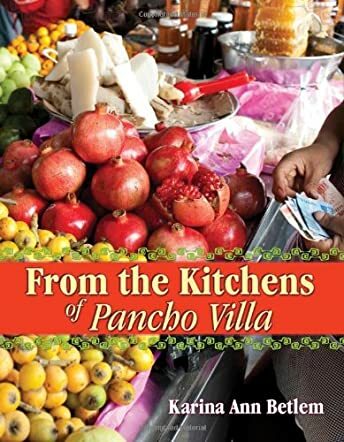 Karina Ann Betlem has done an excellent job of sharing her new home and community with the rest of the world in her cookbook, From the Kitchens of Pancho Villa! I have thoroughly enjoyed reading this book. Not only is this cookbook filled with so many delicious-sounding recipes, but it is also filled with pictures and stories that bring to life the cooks that are featured and also add a homey feel to the recipes. I enjoy Mexican food and going to Mexican restaurants; however as Karina has pointed out, this is not experiencing authentic home-style Mexican cuisine and these recipes are ones that anyone could make at home. These recipes are well-written as they can be easily followed so that the dish is accurately made and they do not appear to be time consuming. The ingredients chapters are a great addition to the cookbook as I am not familiar will all of the ingredients that are frequently used and the explanations that are provided are enough that I would feel at ease with working with them. This cookbook is a must-have for anyone whom enjoys Mexican cuisine. A cookbook I can finally use on a daily basis, the recipes are fast and I don't have to spend a lot of money or time in the kitchen. Each recipe either has a story or description so I can decide whether to cook it or not. I love just reading the introductions to each recipe. She adds humor and real life to Mexican cooking. The cooks in the book are inspirations themselves and I enjoy reading their stories too. I am thrilled with this book, and making it part of my Christmas gift giving. Thanks Karina! I received this book yesterday and couldn't put it down...the "real life" way this book is written is beyond words. The true stories of the individual cooks in this book are an interesting lesson for all of us. I can't wait to try the recipes, thankyou so much for this cookbook!!! What an amazing cookbook!! The recipes are so easy to follow and most everything can be purchased within the States. I love that Karina has included tidbits about each of her featured cooks, herself, and her own family. It makes you feel as though you were in the kitchen with them when they made each of their creations and as she wrote. I have discovered that for everything I have tried, they do come out the way that I think they should. There isn't any of that second guessing like most of us have to do when we try something from somewhere and think 'ewww is it suppose to do that'? Not here. Awesome recipes. Awesome stories. Awesome author! Can hardly wait for the next one! Thank you Karina, for taking me along on your journey through Mexico and Mexican cooking! I have just about every cookbook imaginable and so of course, I needed to buy this one. I had no idea what I was getting myself into. When I got the book, the cover was beautiful, so I started flipping through it. I didn't get very far and decided I needed to start at the beginning. I read it all afternoon, forgetting I needed to prepare dinner for my family. I had read a recipe earlier called Chicken with Slices of Mushrooms and since I had all those ingredients (actually not many ingredients at all) I decided to test it out. Karina said it was easy, fast and delicious.......so I wanted to give it a try to see if that was really true. Well, it WAS! My family devoured the chicken and I have earmarked it to make again soon. Most cookbooks are about just the recipes, but From the Kitchens of Pancho Villa is also about the people. I felt as if I was getting to know these cooks that she obviously cares very deeply for. Their individual stories are inspiring and many times humorous. I will no longer use my pressure cooker without thinking of the lid embedded in the ceiling! As I said before, I had no idea what I was getting myself into, well, I will tell you. I keep this book in my kitchen and I will not be happy until I have made every recipe in it! I am going to give this cookbook to everyone on my birthday list this year, and if they don't already have it on their own, my Christmas list too. Thank you Karina for one of the best cookbooks in my collection - I will use it well. I am a man on the go with little time or desire for cooking. On the recommendation of a friend I purchased "From The Kitchens of Pancho Villa". This book is filled with interesting bio's on the contributors but equally important to me is that many, if not most, of the recipes in the book are not only easy for me to follow (nothing fancy), but also, require little time to prepare. Just what I needed. Not to brag but by following the recipe closely, my meals are suddenly 1000 percent tastier and probably 1000 times healthier. Thanks Karina - you salvaged my diet.